"We won't spend all day, every day, fishing, will we?" How many times have I heard those words before. 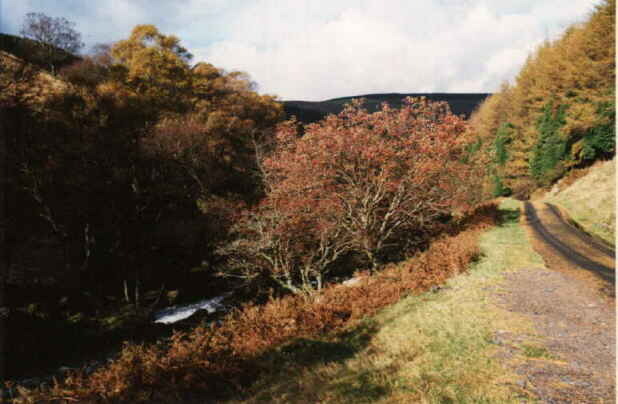 Every autumn, even if it is only for a day, I visit the Vyrnwy to greet the returning salmon as they reach their winter terminus on the gravels below Dolanog Weir. "We could book the cottage at Mill Farm (already booked), go for walks, visit the bookshops in Machynlleth (Sandra is an avid reader), eat out in the local pubs and restaurants. ......there wouldn't be any cooking to do ..... Well it was only a suggestion." "I might perhaps just manage a couple of hours one afternoon for a bit of grayling fishing ... only if the conditions are right", I added as I started to pack a considerable amount of tackle into the deeper recesses of the car's boot. "I really just want to go to see the salmon again, perhaps photograph them. The rest of the time we can just walk in the woods, pick a few mushrooms for a casserole... have you packed your sketch book?" "I thought you said there'd be no cooking to do." "What?, well no, I mean I'll make the casseroles of course." Sandra had not been to Dolanog for over two years. I knew she would not take kindly to me fishing all day. I promised myself to be on my best behaviour: break her in gently to the possibility of that the few hours fishing one afternoon out of four might become just a little longer. As it turned out, my piscatorial planning was more than a little optimistic. It had been raining hard over the weekend, and flood warnings, with red and amber alerts, abounded for the local rivers as we set off in the early hours of Monday morning. As we were going for four days I was not too depressed: the upper Vyrnwy is a very steep mountainous river and never remains in spate for long. Besides there is the Lake and its dam ten miles upstream which help to halt the run-off. Thinking ahead to the swollen river I decided to collect a few brownie points by suggesting that we stop at Hay-on-Wye for a good part of the day, browsing its 34 bookshops. Many years ago when we first visited Hay, its second hand book prices were on a par with elsewhere in the UK, and, as they had such a vast selection on all topics, it was a great place to go. These days the booksellers have caught on to the fact that if people make a special day trip to buy books there, then they are hardly likely to go home empty handed. Consequently book prices have rocketed. C'est la vie. Any how, the day remained dry, some good books were found and the beer was excellent.. Time for a change of driver. That's the advantage of taking along a companion! When we finally reached our destination it was getting dark, and driving into the farm yard the headlights picked out a line of driftwood resting against the garden fence. "Had some rain then John? ", I asked as I was greeted by a huge hand thrust towards me from the darkness of the farmyard. "Just a little", was the dour reply. 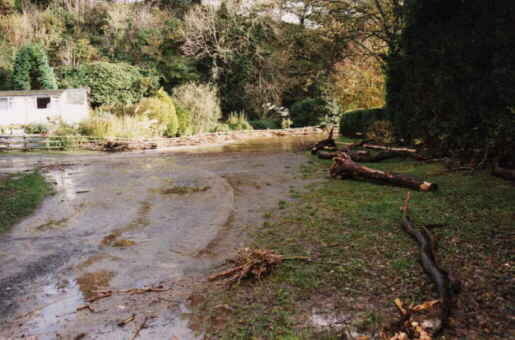 "We came back from holiday ourselves on Saturday night, .... Found the yard under water. The Landrover was in one and a half foot of water in the barn. The river's dropped since then as you can see." ... Well I couldn't see that much, but I took John's word for it. After unloading our gear into the chalet, we joined John and his wife Gwyn at the farm for a few beverages and a long overdue catch up on all that had been happening since I was last there. Our arrival seemed to herald yet another turn in the weather, and as we hurried back to the chalet later that night, the wind was already tearing at the trees, and the outside lights showed the rain being driven horizontally across the yard. You can always hear the river running merrily just outside the window at night... however, the few malts followed by the few Irish's in the company of John and Gwyn ensured that we slept heavily that night, and we heard nothing till morning. At daydbreak we were awoken not by the sound of the river outside, but by the thunder of the weir some 300yds upstream. A glance out of the window revealed a muddy torrent and a steady procession of trees and other debris racing past, some catching on the railings of the now submerged road bridge servicing the farm... 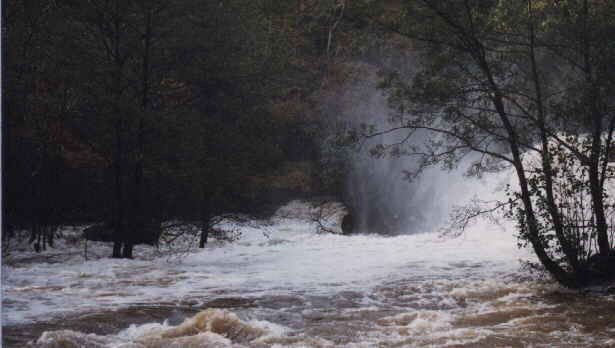 The gravels that the salmon would be returning to were under six foot of these rapids. No fishing today then, that's certain. By ten o'clock, the rain had ceased, but the river continued to rise a little. 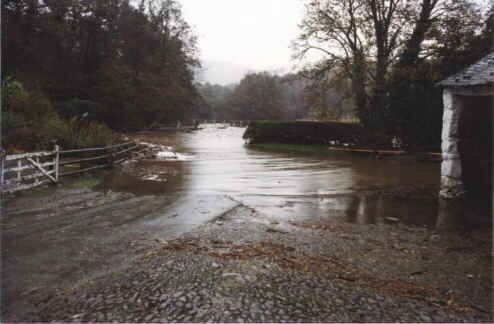 Fortunately, the road to the farm had another exit over the hill, so we decided to visit Lake Vyrnwy in her autumn slendour, if it had not been all washed away during the night. 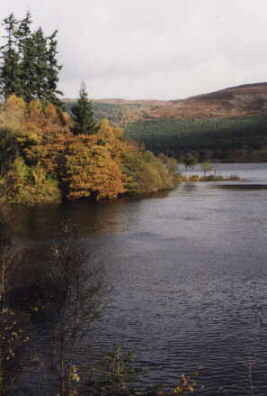 The Lake was formed when the dam was built in the late C19. At the time it was the largest man made reservoir in Europe. It measures approximately 12 miles around and is over 5 miles in length. 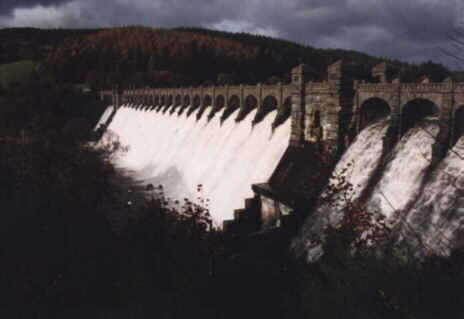 The masonry of the dam is exceptional, providing 33 arches: the cental arches of which used to permit an overflow cascade of nearly 600ft across and a fall of 80 ft in height. 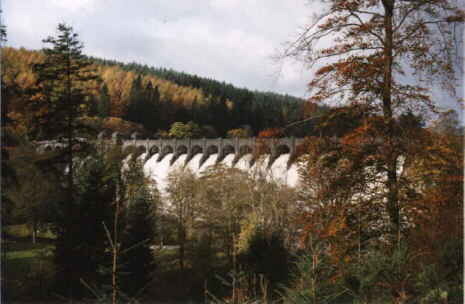 The names of the numerous men who died whilst constructing it are remembered on a bronze plaque near the dam. (Plaint lawyers would have had a field day, if this had happened in the last few decades). Since I have been visiting the lake I have rarely witnessed more than a trickle passing over the top. Usually the level is way down from the sill, because all the water gets drawn off from the bottom for Liverpool long before levels approach the overflow mark. It then flows through a pipeline drilled through the mountains. 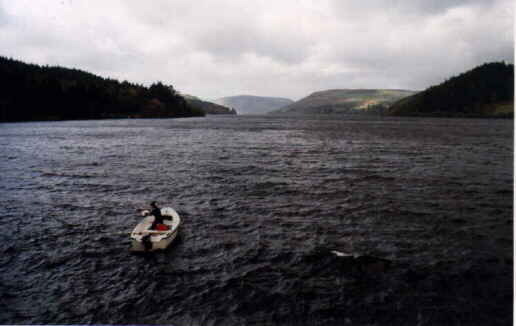 The remaining water is used to supplement the R Severn at times of low flow. This morning the flow billowed out through the arches like an avalanche of snow, caught in the sharp sunlight that pierced the heavy rainclouds as they chased across the sky, blackening the backdrop of the mountains. The speed at which they raced made it difficult to capture the scene. In a moment a vivid scene would be gone, or if it stayed long enough to photo, then you would get soaked for you trouble at your end. But startling colours. As we drove over the dam, I thought of taking a snap of the length of the lake.. Peering over the wall I saw this chap in a wet suit, baling out his dinghy on the edge of the dam. Heaven knows how he got there, or what he was hoping to do. Neither he nor the boat were there when we returned later, so I assume that he got it going. There were white horses on the lake and I have never seen such a feed lane. We drove along it's length to the narrow winding road at the top end which travels up over the Berwyn mountains to Bala. 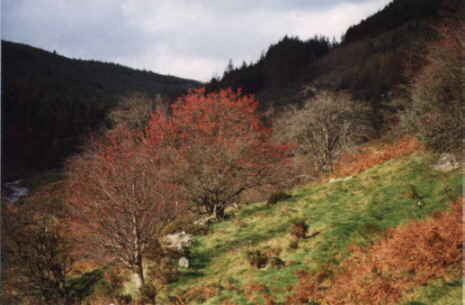 Time and again the sun would burst through and kindle fire in the tops of the rowan on the wild hillside. 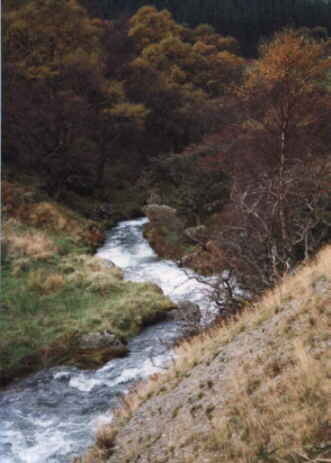 The streams were full to bursting with torrents crystal clear water. Totally unfishable, but to any fisherman they were a serious driving hazard as they drew your eyes from the road at every turn. Throughout our drive the hillsides flashed their colours in the autumn sun, like butterflies snapping open their wings. I stood and froze my fingertips off for 20 minutes and more, trying to capture this scene, and then the sun only sneaked through for a second or two. Bala was grim. Bala is always grim. A tourist trap providing jobs and economy for people who obviously resent the huge influx of English visitors into their kingdom in the summer, yet uncomfortable about the fact that they are happy to make a living taking their money. Bala is said to be a magical place. For me there is no magic. A cup of coffee and we were gone again. 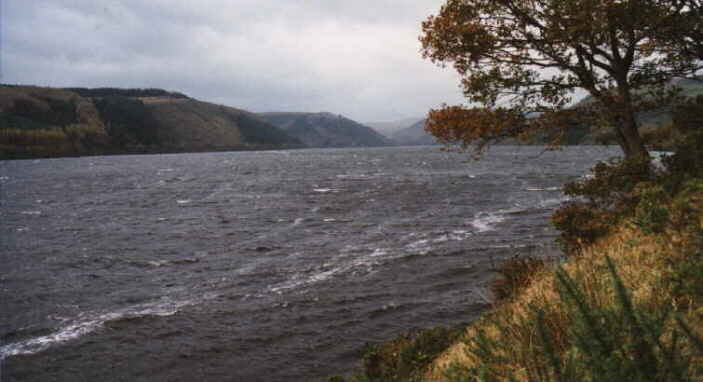 Travelling back, the wind had abated, and the white horses had gone from Vyrnwy's surface. Back at the farm, the river had also dropped a foot or two. Small tree trunks, the morning's driftwood, littered the yard. The afternoon sun was bright, and the sound of the weir was still deafening. But there was hope for a better day tomorrow, and perhaps an hour or so grayling fishing to go with it. Post Script: I never did get that grayling fishing. I never even unpacked my rods. The next day it poured again. To make matters worse, I dropped my camera and damaged the lens. We didn't see any salmon, mainly because the river was just so high. We did see one salmon tail however, discarded by an otter at the foot of the falls. So someone got some fishing in. For all that, it was a good trip, and I kept my promise not to spend all my time fishing. Just a big thank you for a great week in Wales. My feet ache! Just before it got sunny and too bright to fish yesterday I worked my way up to the pool above Cottage. That big fish of yours was taking flies with passion off that rocky outcrop, so I worked my way up to him and put your caddis on his nose. The line straightened and the battle was on. He made a huge run to the bottom end of the pool and then went deep, then did the tail walk and splash about trick, my arm got to the very tired stage and my little rod was bent double. Then he went for the roots next to me and after that I started to believe I could get him. Waited until he was well played until I got the net ready and then drew him over and out! 16 inches exactly - fat on caddis, worm and beetles. The perfect end to a great week. The contents of these pages should not be copied without the author's personal permission.